Get right away from winter fogs and frosts with a tropical holiday at one of Australia’s top resort golf courses. Paradise Palms Resort and Country Club has released its three day, Stay ‘N’ Play package inviting guests to experience a tailor-made range of golf and pampering while luxuriating in the regal confines of its world-class, resort and country club. Guests can take full advantage of the resort and country club facilities that include accommodation in the brand new, 96 room resort, dining in Fifty Nine Restaurant and Bar, a round or two of golf on one of Australia’s top championship courses, massage and spa services and even, a more light-hearted swing at the newly completed mini-golf. Set on 126 ha of undulating surroundings surrounded by rainforest covered hills and just minutes to the Coral Sea, Paradise Palms provides an idyllic picture-perfect playground for holiday makers. Add to this, its convenient location just 20 minutes drive north of Cairns airport just five minutes from Palm Cove and half an hour from Port Douglas. It’s humpback heaven in Hervey Bay with the arrival of the whales to their favourite Australian holiday destination and the official opening of the local whale watch season on August 1. The “Blessing of the Fleet” of whale watch boats at the Harbour on Saturday evening also signals the start of the week long Hervey Bay Whale Festival. With the arrival of the whales come some great accommodation and whale watch packages for visitors in the coming months, including opening specials for the new Ramada Hervey Bay opening late August. From $AUD196** per night in a Studio Room. Includes whale watching cruise for two people with Spirit of Hervey Bay. It’s more than a fluke when the first pods of migrating humpback whales start passing the Queensland coast. For the professional whale watching fleet at Hervey Bay it’s time to get the boats primed for another busy season as the whale watching capital of Australia. Whale season in Hervey Bay officially starts on August 1 with the blessing of the Whale Watching Fleet and is followed on August 8 with the Hervey Bay Whale Festival. The range of whale watching tours includes dawn trips for the early risers, morning and afternoon half-days journeys and full day cruises for the real enthusiasts. The choice of vessels includes a large rigid inflatable and sailing and motor-powered catamarans. Operators in the 2009 fleet include newcomer Freedom Whale Watching offering cruises on Freedom III, a 58’ catamaran previously owned by renowned documentary-maker Ben Cropp; Hervey Bay Whale Watch “Quick Cat II”, Mikat Whale Cruises, Awesome Adventures “That’s Awesome”, Blue Dolphin Marine Tours, Shayla Sailing Cruises, Spirit of Hervey Bay Whale Watching Cruises, Tasman Venture Whale Watching and Whalesong Cruises Hervey Bay. Accommodation options are also extensive and this year will include the new Ramada Resort Hervey Bay which is scheduled to open for the start of whale watching season and has special packages for two adults including two nights accommodation and a whale watching tour from $AUD170 per person. Details of the tours and other accommodation packages can be found at: www.whalesherveybay.com.au. Each year pods of the humpbacks make the 5000km migration from the Antarctic to the warm waters off the Queensland coast. The calm, protected waters of Hervey Bay are a favourite resting spot for the whales, and also for nature-lovers who can safely watch these lovely creatures as they frolick, mate and bond with their new babies in the warm waters. The humpbacks can weigh up to 40 tonnes and reach 19 metres in length. They are also one of the more active of the species and love to show off with a range of activities ranging from a ‘blow’ to tail slapping, pectoral fin waving and breaching. A national survey of 12,000 people has revealed that more than 73% of Australians prefer to book their domestic flights online while only 16% prefer to use travel agents. However, when it comes to overseas trips, only 35% of Australians book their flights online with 44% using travel agents. The survey was conducted by News Limited as part of the relaunch of its expanded new national travel section, Escape. Run through the escape.com.au website, the survey reveals some interesting facts about Australians and their passion for travel. In addition, the internet is also becoming a valuable tool for travel research, as increasingly, travellers use the net to investigate where they want to go. 80% of respondents said they used the internet when deciding where to go, 68% used a newspaper travel section, 67% used friends and family, 58% used brochures and 56% used television programs. The three main reasons for using a travel agent included the superior knowledge of travel agents, helpful staff and having a single point of contact. The relaunched Escape section will appear weekly in News Limited metropolitan newspapers from this Sunday and online at escape.com.au, where there will be regularly updated blogs and travel news. Escape is about inspiring readers and helping to make travel dreams a reality. It is about understanding reader wants and needs – and then delivering them the information they need to make the journey as easy, and memorable, as possible. The section will be edited by Brian Crisp, the Travel Editor of The Courier-Mail. During his career in journalism, Brian has held senior news positions in Sydney, Brisbane and Perth, where he was editor of The Sunday Times. He has been the Travel Editor at The Courier-Mail for five years. Brian sees part of his job as road testing holidays for his readers – making sure they get the best value for money. Brian will head up a team of writers and travel experts across Australia, addressing more than just destination-based travel. Regular sections will include favourite travel spots from international celebrities, plus contributions from well-known writers and journalists. The new section will explore travel trends and be deals oriented. Escape's relaunch includes an expansion of the brand to a cross-platform model with a significant online component. The printed section will run in The Sunday Telegraph (NSW), Sunday Herald Sun (VIC), The Sunday Mail (QLD), the Sunday Mail (SA), The Sunday Times (WA), and The Sunday Tasmanian (TAS) and additional content will be online at escape.com.au. Alan Oakley, Editor, National Features for News Ltd, said that Escape's research showed Australians were looking for value-based information as well as aspirational travel writing. "Our focus will be on enticing readers with excellent travel journalism and then telling people how they can experience each destination in the most cost-effective way. There's is a real appetite for holiday deals, and we'll ensure that Escape is the number one destination for value travel from day one," said Mr Oakley. Sunday's first issue of Escape will be looking at Great Drives around Australia and readers will have the opportunity to win one of 13 Family Holiday Travel Packages from Accor Vacation Club and Virgin Blue. Overseas travelers seeking a unique and personalized experience decide to book the services of some local private tour guides. Their positive feedback is a bullish endorsement of the value a tour guide brings to any holiday, labeling them almost essential. A jovial group of 15 British weekenders meander through the narrow streets of Temple Bar in Dublin seeking out the next "traditional" Irish bar. In Bangkok, it's an elbow-jabbing scrum around the Emerald Buddha at the National Palace as tourists from dozens of nations jostle for the perfect photo opportunity. In Cancun, Mexico, thousands of students on Spring Break swarm in and out of beachside pubs and hotels in a collective mass. Where can you enjoy an alternative travel experience which does not require you to share it with busloads of other tourists? The answer: through the local wisdom of your very own private tour guide. A tour guide enables you to experience their destination in a unique way, through the eyes of a local professional. Below, some of OurExplorer's clients illustrate the value a professional tour guide can provide any independent traveler. From discovering family roots to finding that gem off the beaten track experience, private tour guides facilitate you to see your overseas destination through the eyes of a local. So before you jet off on your next holiday check out in advance some tour guide resources e.g. www.ourexplorer.com and see how you can be a local in a foreign land. Return Flights to Ireland from AUD$1759* Including Taxes with Virgin Atlantic! Virgin Atlantic has just launched some incredible fares from Australia to Ireland from $1759* return including taxes. Why $1759? Because that was the year in which Arthur Guinness – the man responsible for creating Guinness Beer – signed a 9,000 year lease on the St. James's Gate brewery in Dublin, which makes this year the 250th Anniversary of Guinness! At 17.59 local time in Dublin on September 24th a worldwide series of events will kick off to celebrate the 250th anniversary of Guinness, with celebrities such as Sir Bob Geldof, Guy Ritchie, Jerry Hall and Sophie Dahl raising a pint to Arthur Guinness to start a remarkable global toast. The focal point of the celebrations will be in Dublin, the spiritual home of Guinness where some of the biggest names in music, including Kasabian and Tom Jones will perform live in the heart of the St James's Gate Brewery. Melbourne's Hotel Windsor has announced a $260 million development proposal aimed at securing the future of the city's only 19th century grand hotel. The proposal, lodged with planning authorities including Heritage Victoria, aims to ensure the long-term commercial viability of the hotel and re-establish the Hotel Windsor as the pre-eminent Melbourne hotel. Mr Adipoetra Halim, director of the Melbourne-based Halim Group which owns the hotel, said: "We want to recreate the Windsor as one of the world's great hotels. But it cannot survive as a leading hotel even in its local market without a major improvement in facilities, services and space." • Refurbishment of the original hotel building and its key historic features. The exterior will be restored more faithfully to its original appearance, including the reinstatement of the Spring Street colonnade. • A slim and elegant 25-storey tower – set back 25 metres from Spring Street and Bourke Street - that acts as a "curtain" draped behind the original historic hotel building. It presents a distinctive form and finish that acts as a backdrop and "frame" for the hotel. The tower will include additional guest rooms and suites, meeting rooms and health and leisure facilities. • A new corner building to replace the 1960's north wing addition. The ground level would be fully glazed with retractable openings, allowing al fresco dining and refreshments. The upper levels will include new banquet and function facilities, meeting rooms, guestrooms and an indoor pool. A Statement of Heritage Impacts by Lovell Chen heritage consultants says the development "has been approached and designed in a manner which seeks a balanced outcome in which key heritage values of the place are maintained and its future as a grand hotel better assured." The hotel will have an extra 152 rooms, bringing total accommodation to 332 rooms and suites. An economic analysis prepared for the Hotel Windsor by Essential Economics says the project will create 560 jobs a year during the 30 month construction period. Once built, the hotel will employ 135 more people and create another 175 jobs through the employment multiplier effect. The refurbished hotel will generate additional visitor spending of $14 million per year in Melbourne. The plans, prepared by architects Denton Corker Marshall, replace a previous submission for the renovation of the historic hotel. Refurbishment plans for The Hotel Windsor were previously approved by Heritage Victoria in March 2008. Since then, full ownership of the property has been acquired by the Halim Group, which began a full review of long-term options for the site and its economic viability. The review included an analysis of comparable landmark hotels around the world. Hotel Windsor CEO and general manager David Perry said: "The Hotel Windsor is at an historical crossroads. It was born during the Marvellous Melbourne period when this was one of the richest cities in the world. But today the old duchess looks tired and dowdy. "To maintain relevance in the contemporary tourist market, she needs a modern makeover like some of the great other old hotels around the world." Mr Perry said the Hotel Windsor was built just before the Ritz in London, the Ritz in Paris, the Waldorf Astoria in New York and Raffles in Singapore. But the Hotel Windsor had slipped behind these hotels because it had not expanded and adapted like the others. Mr Perry said the Hotel Windsor had the best afternoon tea experience in Australia – and it was staying exactly the same – but no swimming pool. It had a magnificent Grand Ballroom, but no space for big functions and guest rooms considered too small by modern standards. It had a magnificent past, but an uncertain future unless it was expanded and improved. He said: "This concept is an exciting major project for the hotel, for the City of Melbourne and for Victoria's tourism sector. The proposed new design is an exceptional piece of contemporary architecture that complements and highlights the original Hotel Windsor, which regains its dominance and elegance against the new backdrop. "Most importantly, the plan delivers a world-class luxury hotel, providing the range and number of guest rooms, dining options, function rooms, indoor pool, gymnasium and spa areas commensurate with the world's great grand hotels. The proposed renovation and re-development is subject to planning and financial approvals. Subject to these approvals, preliminary work is expected to begin in the last quarter of 2010. ZUJI rolls out 'flexible date search' for flights on its OTA sites in Australia, Singapore, Hong Kong and India. Increased conversion and branding opportunities for airlines as a result. Online travel agency (OTA) ZUJI has introduced a flexible date search option for flight bookings on its core Asia Pacific sites as a new service for customers and ZUJI's supplier airlines. The +/- 3-day-view reveals available flight options for the three days before and after the preferred date of travel, providing travellers with a 'simple' table showing multiple airline and flight options. - their weekday, and off peak travel flight options (where fares may be cheaper, and more appealing to travellers with flexible travel plans). - flight options on alternate days, which is especially important for carriers which do not operate daily flights. - their brand and consistently competitive fares, as carrier logos appear when the fare is scrolled-over for all dates of travel displayed on the calendar grid. Beyond the flight calendar path feature, ZUJI's 'TripSaver' technology offers an opaque way for airlines and hotels to market and promote their product to travellers. This 'dynamic packaging' feature was introduced to the above ZUJI sites earlier this year as part of its investment in serving suppliers and travellers great online travel experiences, despite the downturn. NYC Sightseeing Package – Hotel Plus Discounts for the Big Apple’s Best Attractions. New York City is not typically known for its discounts. But thanks to these six Hilton Family of Hotels in New York City, your trip to the Big Apple will be fun & affordable! This exclusive package includes overnight stay at Doubletree Guest Suites Times Square, Doubletree Metropolitan Hotel, Embassy Suites Hotel New York City, Hampton Inn Manhattan Times Square North, Hilton Garden Inn New York/West 35th Street or Hilton Garden Inn Times Square - PLUS coupons valid for some of New York City's best attractions including Circle Line & the BEAST, CitySights double decker sightseeing tour, Planet Hollywood, Madame Tussauds New York & more. · Circle Line 2 or 3-hour sightseeing cruise or BEAST Speedboat ride. · World Yacht Dinner Cruise. · CitySights NY Double Decker All Around Town Tour. · Madame Tussaud's New York. · Equinox Wall Street (14 Wall Street location only). · GO Airlink Shuttle - RETURN trip from hotel to airport. Don't miss out on your chance to save Big Apple style. Book the NYC Sightseeing Package today by visiting www.hiltonfamily.com/sightseeing or by calling 1-800-HILTONS and mentioning plan code YW or YW1. Just a short flight from Australia’s East coast (3.5 hours from Sydney, 2.5 from Brisbane and 4 from Melbourne) a holiday to Vanuatu has the perfect balance of resort style relaxation and authentic cultural discovery, and with 13 flights a week with Air Vanuatu and Pacific Blue it has never been more accessible. Vanuatu offers all the South Pacific island splendor expected – coral reefs, waterfalls, crystal clear turquoise ocean and abundant fresh seafood. Add to that fascinating tribal life, one of the world’s most accessible active volcanoes, one of the world’s best diveable shipwrecks and according the happy planet index in 2006 the world’s happiest people – and it is little wonder the country is a favorite among Australian travelers. In the cosmopolitan capital Port Vila, you can spend time relaxing and pampering yourself at a range of resorts, eating some of the finest food and fresh organic produce in the South Pacific and shopping in the town’s local markets or stores. Although it may be tempting to sit by resort pools sipping cocktails, Port Vila is also about getting out and about, exploring all the islands have to offer and discovering the captivating Melanesian Culture. There are a range of adventures to entertain all tastes from cultural village experiences and sightseeing tours to abseiling down waterfalls, guided off-road buggy hire, horse riding and cycling. Not to mention diving, sailing, fishing, surfing and all other water based pursuits. Vanuatu is an easy place to travel solo if you’re one who likes to explore and discover a country on your own. In Port Vila most accommodation is located around 15 minutes from the town centre and there are local mini buses which will take you anywhere for approximately $1.25. You can also explore on foot, catch taxis or hire a car. Port Vila is lively at night time too. There are 68 restaurants and a range of night clubs so there are plenty of options for a romantic meal or night out. Kava drinking is also a popular past time for the local Ni-Vanuatu people and a visit to a Nakamal (Kava bar) for a ‘shell’ of Kava can prove an interesting start to an evening. However, if it is real, authentic adventure you are after, getting out to one of Vanuatu’s outer islands is a must. There are 83 islands in the archipelago and combining at least one of them with your visit to Port Vila can give you a taste of what remote island life is really like. The most popular outer islands to visit in Vanuatu are Espiritu Santo and Tanna. Both offer exceptional once-in-a-life time experiences and a chance to see a very different side of Vanuatu. As one of the world’s most accessible volcanoes, the fiery Mount Yasur attracts travelers to Tanna. Standing on the rim of this powerful volcano watching lava explode into the air is certainly worth the trip. However, there is also fascinating culture to discover with interesting cargo cults such as those that await the arrival of mystical John Frum or the return of Prince Phillip. A visit to a custom village where locals have rejected western ways of life and still live traditionally, offers you a peep into the past. As with all these beautiful islands, there are also amazing landscapes with waterfalls, underwater caves, coral reefs and beautiful Port Resolution to explore. The water surrounding Espiritu Santo has long been a Mecca for divers and snorkelers and enthusiasts travel from all over the world to explore historical relics from the island’s days as an American base in WWII. Popular sites include world’s most accessible ship wreck, The SS President Coolidge and coral covered American wrecks and war relics at Million Dollar Point. However, the destination has recently become much more of a holiday paradise. Air Vanuatu has recognised this potential, launching direct flights from Brisbane and Sydney to Santo in 2007. For adventure seekers Espiritu Santo offers a myriad of activities including trekking to Millennium Caves, visiting villages still living in the traditional way and kayaking from one idyllic island to another. For those who prefer to relax, they can lay back and take in the surrounding white sands and blue water of this island paradise made famous in one of the most popular books in history, Michener’s Tales of the South Pacific. Days can be spent picnicing and relaxing on one of the islands magic white sand beaches such as Champagne Beach or by a blue hole where crystal clear blue water is filtered through limestone and coral to create an idyllic inland pool. A visit Pentecost Island is also becoming a popular side strip. Every Saturday in April to June visitors flock to the island to see the Naghol Land Diving ceremony. This awe-inspiring ceremony sees boys as young as eight and men build towers up to 20 meters high and jump from them as a show of strength and to encourage a good yam harvest. Villagers dance and stomp their feet below making the atmosphere electric as nervous visitors watch and hope that the diver will survive the dive into the ground below. With 83 islands there are countless adventure options and experiences in Vanuatu. There are regular cultural festivals and events on islands where you can visit villages and see a totally different way of life, happening so close to Australia. Hawaiian Airlines has again stepped up air fare competition between Australia and the US mainland, extending and expanding its “Hula Your Way to the USA” fares to 10 mainland destinations, via Honolulu. The latest range of Hula fares, which start at AUD$1325 per person, including tax, enable passengers to fly from Sydney to their choice of Las Vegas, Los Angeles, San Francisco, San Diego, San Jose, Seattle and Sacramento, plus the three new options of Oakland, Portland and Phoenix. “Our Hula fares are a great option for Australians planning to visit the USA, as they can enter the mainland through one city, fly home from another, and stop in Hawaii as well,” said Sherilyn Robinson, Hawaiian Airlines Sales and Marketing Manager Australia. The “Hula Your Way to the USA” fares, in Economy Class, include taxes, plus meals, drinks and mainscreen entertainment on Hawaiian’s flights between Sydney and Honolulu. Hawaiian also offers every passenger a generous free luggage allowance of two checked items, each weighing up to 32 kilograms. * From AUD$1475 (including taxes) ex Melbourne, Brisbane, Gold Coast, Maroochydore, Canberra, Ballina, Hervey Bay, Coffs Harbour and Port Macquarie. * From AUD$1665 ex Adelaide, Albury, Hobart, Launceston, Cairns, Mackay, Proserpine, Rockhampton and Townsville. * From AUD$1825 ex Perth. The “Hula Your Way to the USA” fares are available for departures from now until 24 September, from 07 October until16 December, and again from 13 January until 31 March 2010. All travel must be booked and paid for by 18 September. Not all seats are available at these prices, and some travel agents may charge additional service fees. Some conditions also apply. Hawaiian Airlines flies nonstop from Sydney to Honolulu every Wednesday, Friday and Sunday evening, with connections from throughout Australia with partner airlines. Hawaiian flights depart Sydney at 9.20pm, crossing the international dateline and arriving at 11.10am the same day – a flight time of approximately 10 hours. Now in its 80th year of continuous service in Hawaii, Hawaiian is the state’s largest and longest-serving airline. For more information or to make a booking contact your licensed travel agents or call Hawaiian Airlines toll free national reservation number 1300 669 106. Consolidating its stance as Australia's biggest offshore schoolies events package wholesaler, Unleashed Travel has announced its plans to expand its product beyond its Fiji base with a move into the lucrative Bali market. Unleashed Travel Managing Director Jot Lynas said the company was already selling its December 2010 programs which will be based at the popular Bali Bounty Hotel located in the heart of famous Kuta. Prices for the escorted 10-night Bali packages start from AUD1749* based on triple share which includes return airfares, breakfast and transfers. Package price also includes several on-resort hosted parties with DJs and a day cruise. "The knee jerk reaction we have received from many of our clients to the news certainly indicates that we have made a smart move and we are very confident that we will be expanding further into Bali over the next 12 months," Mr Lynas said. "Having enjoyed great success in Fiji, we felt the time was right to move into other areas and Bali very much fits the Unleashed Travel bill. "But Fiji is proving as popular as ever with schoolies – our 2010 season bookings have already passed the 50 per cent mark – and the destination will continue to represent the major focus for the company." It’s official. The Westin Auckland Lighter Quay is New Zealand’s best city hotel. The Westin has taken out honours in the 2009 Travel + Leisure World’s Best Awards being voted the top New Zealand city hotel in the Australian, New Zealand and South Pacific region and ranked 4th overall. Travel + Leisure readers select their favourite hotels around the world judging them on the quality of their rooms and facilities, location, service, restaurants and food, and value. ‘We are extremely proud of this achievement,” says General Manager Marcus Reinders. “It certainly reflects our commitment to giving our guests a truly Westin experience in New Zealand, which is all about making them feel better than when they arrived. This accolade confirms The Westin’s status as one of the regions premier hotels. The Westin was also recently named in the Top 100 World’s Best Hotels in the Expedia Insiders List. Travel + Leisure and Harris Interactive, an independent research firm, developed a questionnaire that was available to Travel + Leisure readers at tlworldsbest.com from January 15, 2009 to March 29, 2009. In the February and March 2009 issues of Travel + Leisure, readers were invited to participate. A select group of readers also received invitations via e-mail. Respondents were screened by Travel + Leisure and responses from any identified travel-industry professionals were eliminated from the final tally by Harris Interactive. The scores are indexed averages of responses concerning applicable characteristics. For hotels those characteristics are: rooms/facilities, location, service, restaurants/food, value. Optional: for business, for families. A long-standing authority in its field, Travel + Leisure has the largest, most affluent audience of any travel magazine. With a portfolio of more than 150 properties around the world, Westin Hotels & Resorts is in the midst of the most robust growth period in the brand’s 77-year history. Westin Hotels is the fastest growing upper-upscale brand in the world with plans to expand to more than 250 hotels in the next five years. Westin Hotels & Resorts is owned by Starwood Hotels & Resorts Worldwide, Inc. (NYSE: HOT). Starwood Hotels is one of the leading hotel and leisure companies in the world with approximately 850 properties in more than 95 countries and 145,000 employees at its owned and managed properties. Starwood® Hotels is a fully integrated owner, operator and franchisor of hotels and resorts with the following internationally renowned brands: St. Regis®, The Luxury Collection®, Sheraton®, Westin®, Four Points® by Sheraton, W®, Le Méridien® and the recently announced AloftSM and ElementSM Hotels. Starwood Hotels & Resorts Worldwide, Inc. also owns Starwood Vacation Ownership, Inc., one of the premier developers and operators of high quality vacation interval ownership resorts. For more information, please visit www.starwoodhotels.com. The construction of Wolgan Valley Resort & Spa, Australia’s first conservation-based resort in the heart of the Blue Mountains World Heritage Area, is reaching completion. With the resort’s electrical and water systems completed, the emphasis is now on each suite’s fit-out and interior design. Half of the one-bedroom suites are already fully furnished, and the remainder will be completed by the end of August. Work is well under way on the Main Homestead, which will be the social centre of the resort. The main pool area and gymnasium, as well as the resort’s luxury Timeless Spa, will be completed by the end of July. Built on the same principles as Emirates’ acclaimed Al Maha Desert Resort & Spa in Dubai, the resort is fully integrated into its environment. It incorporates as many Ecologically Sustainable Design principles as possible, including rainwater collection, full recycling of all domestic water, heat exchange technology to reduce electricity consumption and the use of solar panels for all hot water systems. The resort has over 100 solar-energy units, significantly reducing its energy consumption and resources footprint. Additional measures aimed at reducing the resort’s carbon footprint include efficient room orientation to reduce heating and cooling requirements, modern insulation envelopes and wide traditional verandas, which increase airflow around and through the buildings. The resort even makes use of traditional windmills instead of electrical pumps. From an architectural perspective, the resort was built with respect to the Australian identity and local rural history. The timeless design, inspired by original Federation style, is reminiscent of traditional rural Australian homesteads. However, it incorporates contemporary practices to include some of the world’s best environmentally protective building materials and technologies. Wherever possible, natural and recycled materials such as sandstone and timber were sourced locally within a 100-km radius around the property. Most of the tradesmen, craftsmen and sub-contractors were employed locally. This approach not only assisted the growth in the local economy at a time when this was most needed, but it also significantly reduced the construction’s carbon footprint. Emirates’ Wolgan Valley Resort & Spa has been fully committed to supporting regional artisans, and most of the furniture and artwork were commissioned and sourced locally. Bespoke timber furniture pieces were manufactured in regional New South Wales, using superb Australian hardwoods, much of it recycled. Local carpenters were commissioned to create The Wolgan Range, the resort’s signature furniture collection. Fallen ‘oldwood’ eucalyptus trees on the reserve were milled to create unique furniture pieces, while local ironsmiths created the resort’s lamp fittings and chandeliers. From an environment and conservation perspective, landscaping efforts in and around the resort have also been in place from the start of the resort development. A two-year programme for the removal of all invasive and damaging noxious plants from the property was undertaken. Grass has been seeded and 25,000 trees are being planted, using seeds from native species collected onsite and grown at a local nursery in Lithgow. This ambitious tree-planting programme has been made possible by the support of local volunteers and an international student volunteer organisation, with over 60 students volunteering time in June and July to assist with the resort’s conservation efforts. Planting is well on target, with over 20,000 trees planted since the beginning of June. For the second consecutive year, Wolgan Valley Resort & Spa will also be a planting site for National Tree Day (2 August 2009) and another 3,000 trees are expected to be planted. With 4,000 acres of land dedicated as a wildlife reserve and bordered by two of Australia’s most prominent National Parks, the Wolgan conservancy project re-establishes and secures a future for many of the region’s indigenous and endangered species, which have been under critical pressure from introduced flora and feral predators. Almost 40 km of barbed wired fencing were removed from the property to reduce wildlife being fatally snared while attempting to jump or pass under the fence. Wildlife corridors are now being established in partnership with local conservation organisations to support native wildlife movements around the property and into adjoining World Heritage Areas. A 50 hectare feral-free area has been secured to protect the smaller, more vulnerable species. During the construction phase, Emirates worked with local and state conservation organisations to address their concerns on the creation of feral-free areas. Enormous efforts have been made in the area of conservation, ensuring that all contractors on site received extensive training on how to prevent environmental damage and protect the local fauna and flora. Not a single tree was destroyed by the construction of the resort. “In terms of wildlife diversity, we’re already starting to see the results of our efforts, with increases in the density and movement of wallabies and wallaroo populations into the valley,” Joost Heymeijer commented. Wolgan Valley Resort & Spa is the only resort in recent history to receive permission to be built within a World Heritage Area. Following some of the most rigorous legislation and environmental controls in the world, this project is of extraordinary significance, not just within Australia but on a global level as well. The resort adheres to World Heritage Committee standards and has exceeded the minimum requirements of construction controls imposed by both State and Federal Agencies – positioning Emirates as the only foreign investor carrier with such level of commitment to Australia. Food Trail Tours, Cairns now offer food and wine tours, to the world’s first tropical fruit wine region, the Cairns Highlands (Atherton Tablelands). Tours depart Cairns, Queensland, six days a week. This sightseeing tour to the Cairns Highlands with Food Trail Tours is a day away from the crowds, visiting both the wet and dry tropics, while exploring what the local food, wine, farms and producers of Tropical North Queensland have to offer. With tropical fruit wineries, macadamia and coffee plantations, as well as a cheeses factory and a hint of chocolate, there is something for everyone. Clients experience interactive farm tours, meet locals and taste different local food or wine, at every stop. Visiting, small family farms and being able interact with the owners and family members who work the business, provides a wonderful change of pace, and insights into, Australian country life. Taj Hotels Resorts and Palaces is delighted to announce the opening of Taj Cape Town in December 2009, adding yet another string to Taj’s international bow. This new landmark will offer the signature Indian hospitality and luxury accommodation synonymous with Asia’s leading hotel group, within South Africa’s thriving, cultural and tourism capital. The Taj Cape Town is located on St George’s Mall, in the historic heart of the city. In keeping with the group’s tradition of breathing life into iconic properties, the hotel is being developed within two buildings of historic significance: The Temple Chambers, also known as the Board of Executors, which was built in 1890 and the South African Reserve Bank building. A new Tower will rise dramatically from behind these Heritage buildings and will feature Tower bedrooms with floor to ceiling glass façades and private balconies. Guests can choose from a range of accommodation including, the Presidential Suite, 155 luxury rooms and suites in either the Heritage or Tower sections, and 22 Luxury Residences. The majority of which boast superb views of the city’s famous St George’s Cathedral, The Parliament and Gardens, and the world renowned Table Mountain. The Taj Club floor will offer visiting business guests a dedicated Private Lounge and Butler service. Taj’s reputation for culinary excellence will be experienced in three restaurants. The Indian specialty restaurant, Masala Kraft, will reside in the old Banking section of the hotel; the contemporary Grill restaurant will offer innovative international and local cuisine with an outdoor dining terrace. The Oyster Bar will offer a more informal setting and a wide selection of South Africa’s award winning wines and fresh seafood. A Cocktail Bar and Cigar Lounge will offer the finest cocktails and limited edition cigars. The Meeting rooms and Banquet Hall are located on the first floor of the property with views overlooking St. George’s Cathedral and Table Mountain. The rooms are equipped with state-of-the-art facilities and have a capacity of up to 100 people. For rest and rejuvenation, The Jiva Grande Spa offers authentic Indian and wellbeing treatments and therapies within six organically designed treatment rooms. There will also be a well equipped gym and heated indoor pool. The Taj group already features 16 international hotels in the Indian Ocean, Europe, Bhutan, USA and the Middle East. With the opening of Taj Cape Town, Taj will continue to enhance its reputation for impeccable service, luxury accommodation, innovative technology and its signature warm Indian hospitality worldwide. Early booking discounts up to 20 percent will apply to the three segments of the tall ship Star Flyer¹s one-off 76-night repositioning voyage from Papeete to Monaco next year. The segments are 34 nights from Papeete (departing February 14) to Balboa (Panama) from $5472; 14 nights from Balboa (March 20) through the Panama Canal to St Maarten in the Caribbean from $5704; and 28 nights from St Maarten (April 3) to Monaco from $5932. The Papeete-Balboa and St Maarten-Monaco prices include early booking discount of 20% (by October 31) pre-paid gratuities and port taxes. Balboa-St Maarten is discounted by 10 percent. The 20 percent reduction also applies to the 38-night great ocean crossing from Phuket to Athens (March 20) on Star Flyer¹s sister ship, Star Clipper, via Sri Lanka, India, four ports in Egypt, the Suez Canal, Rhodes and Mykonos. This cruise, which can also be taken in segments, starts from $6115 after discount. Star Flyer, Star Clipper and Star Clippers¹ flagship Royal Clipper, operate in the Mediterranean in 2010 for a full season of cruising. On July 16th 2009 Anantara Golden Triangle Resort & Spa threw an extraordinary party. A bounty of tropical fruit, brought fresh from the local markets, created a colourful spectacle and lavish feast for the thriving sanctuary of gentle giants at the resort's Elephant Camp, marking baby Raimon's first birthday as a very fruitful occasion. Little Raimon, who was born in the early hours of July 16th 2008 at the Anantara Golden Triangle Elephant Camp, weighed in at just 90 kilos at birth, and was so small that she required the assistance of a step ladder for her first suckle. Now, having reached her very first birthday, the little bundle of joy is not nearly so petite, and definitely not keen on treading the weighing scales, but certainly stands 1.1m tall! From her first unsure steps taken just 30 minutes after birth, Raimon has blossomed into an unruly, but warmly treasured family member amongst the expanding cast of majestic beauties. The past year has flown by for those watching her grow, and under the watchful eyes of her mother, Bua Tong, and her mahout (care giver), she has developed insatiable passions for playground and may even be a budding footballer! As is traditional in Thailand, the baby elephant has two names, an official one for the 'passport' - Pang Raimon, and of course a nick-name for daily use - 'Am'. John Roberts, Director of Elephants, comments, "We are delighted to celebrate the first birthday of such a strong growing girl and watch her benefit from the safety of our Elephant Camp; something that her mother did not have the opportunity to enjoy until later in her life. Raimon is the second elephant to be born at Anantara within a year, but we are not trying to implement a breeding programme. Instead we prefer to bring babies and pregnant mothers from the streets to ensure their future security and happiness. Raimon's mother, Bua Tong, is an ex-street walker, and had been part of our mahout training camp for just over a year before giving birth. Raimon's birth and happy growth is an example of our success in transforming the futures of our elephants, while providing mahouts and their families a rewarding livelihood, and guests with amazing interactive opportunities." Anantara Golden Triangle Resort & Spa is set in 160 acres of indigenous forest and landscaped gardens, occupying a hilltop position overlooking the rolling, green hills of Myanmar and Laos. Set within the resort's lush bamboo forest, Anantara's Elephant Camp is now home to 31 elephants rescued from former grim existence in cities like Bangkok, including 2 babies who were born in the Camp. With the elephants came their mahouts and families in a project that is aligned with the activities of the Thai government's Elephant Conservation Centre in Lampang and the National Elephant Institute, overseen by the Thai registered Golden Triangle Asian Elephant Foundation. While the 'mahouts' are gainfully employed by their elephants, a silk-weaving project was established to provide a livelihood for their families. The children attend local schools, while added security is provided by the Foundation who has fully insured both the families and their elephants. 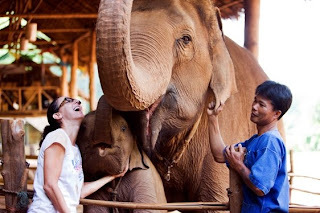 A visit to the Elephant Camp is often the greatest highlight for resort guests; affording the wonderful opportunity of getting up close and personal with Thailand's gentle giants. Bath time at Camp is an exhilarating experience for all, and for the more adventurous, a three-day mahout training course is also on offer. Apart from learning to 'drive' an elephant and gaining rare insight into mahout camp life, meeting the mahouts themselves is quite an experience. For instance Khun Lord is the most senior mahout and Anantara's very own 'elephant whisperer' – named so for his very unusual ability to train baby elephants with tickles and whispers! Anantara Golden Triangle Resort & Spa is located 60km north of Chiang Rai's international airport. For enquiries and reservations, please call + 66 (0) 5378 4084 or + 66 (0) 2 477 0760 or email infogt@anantara.com. For more information, visit www.anantara.com. The Cook Islands, the country which recently legislated itself to become a "Recession Free Oasis" through an act of Parliament, is thriving despite the global economic downturn, thanks mainly to a new wave of Australians discovering its unspoilt charm. This year has seen a marked increase in visitors, particularly as the region has positioned itself as a serious competitor to other Pacific Island nations, with a holiday experience which allows them to truly get away from it all in their own piece of paradise. Cook Islanders embrace visitors as part of their extended family, and invite them to explore their country and its outer islands, with its dramatic scenery and crystalline lagoons, as well as to share the colourful vibrancy of their local culture. Honeymooners in particular are hard pressed to find anywhere that is so romantic at such an affordable price, while many elect to have their weddings there due to the comparatively short wait of only three days to become legally married, compared to the usual month required elsewhere in the Pacific. See www.coralseas.com.au or call on 1800641803 or (02) 89130793. Click on brochure to order for free. Medina Apartment Hotels has today launched a new and improved website at www.medina.com.au . The new look website is sleek and stylish and is full of new features, new imagery and refreshed copy making the site more user-friendly. The website's new features include a hotel locator, an interactive map, image slideshows showcasing each property and a live weather feed so guests know what to pack for their stay. The site also contains handy travel guides with hints and tips about the best things to see and do, the most delicious places to eat and the best shopping precincts for each of the eight cities that the hotels are located in. Visitors to the site can book their stay at any Medina Apartment Hotel using the live booking system to take advantage of any last minute deals and guaranteeing them the best online rate available – minus the booking fee other sites charge. The rate you see is the rate you pay. Medina Apartment Hotels provide the ideal getaway where you can enjoy space, service and style. With 23 locations around Australia Medina Apartment Hotels offer travellers the opportunity to experience the cosmopolitan culture unique to each Australian city, while being conveniently situated amongst theatres, restaurants and cafes making Medina an ideal choice for a city escape. Quest Serviced Apartments opened its doors in Shepparton on July 6, spending $13.5 million on the new development and providing much-needed corporate accommodation to the town's agricultural visitors. The new complex will service the accommodation needs of the local farming and food production industries, but also welcomed technology, government department and bank guests travelling to the town for business in its first two weeks of operation. Quest Chairman, Paul Constantinou, said that during construction, the project generated 200 jobs and brought an estimated $8 million to the region, supporting local suppliers and providers in the process. "Opening up a new property in Shepparton made a lot of sense. The area is a fast growing business hub and Quest is positioned to provide travellers with the right accommodation option," Quest Chairman, Paul Constantinou, said. Quest Shepparton is a modern property, featuring 69 studio, one, two and three-bedroom serviced apartments spread over four levels, with an anticipated 4½ Star AAA Tourism rating. The property includes on-site undercover car parking, gymnasium and conference facilities that can cater for up to 70 people. Located close to the centre of town at 177-183 Welsford Street, Quest Shepparton boasts fully equipped kitchen and laundry facilities, plus broadband internet access and Austar. It will also offer chargeback at a selection of local restaurants. "Quest will have everything the business traveller needs. It will suit people staying for shorter periods and will feel like a home-away-from-home for those who want to stay longer," Mr Constantinou said. The property has been purchased by franchisees Robert Sumpton, Peter Sweetland and Sonya Boaden. Robert and Peter are returning to the region after previously running a motel in Shepparton some years ago. Sonya previously held the position of National Operations Manager at Quest head office and will partner with Peter to run the property on a daily basis. Quest Shepparton is the fifth property to be opened this year by the serviced apartment group, which continues to expand despite today's tough business conditions. Quest has become Australasia's largest provider of serviced apartments, with more than 120 properties across Australia, New Zealand and Fiji. Established in 1988, Quest offers stylish, well appointed and spacious apartments designed with the business traveller in mind. With separate bedrooms and living areas, fully equipped kitchens, additional amenities and high service standards, Quest provides flexible accommodation that allows its guests to work or relax in complete comfort. Put on your walking shoes and head to Maleny on Queensland’s Sunshine Coast to prepare for the Festival of the Walks from August 29 to September 13. The festival program not only includes scenic walks throughout the Sunshine Coast hinterland suitable for all ages but also lots of activities including music and dining. The Blackall Range is a perfect setting for the Festival of the Walks. With a selection of national parks and scenic reserves, Baroon Pocket Dam, lookouts and water courses, the area is great for getting outdoors. Map guides are available to point you in the right direction to experience a magnificent selection of rainforest and mountain walks, ranging from easy to strenuous, from 20 minutes to several days. The Festival includes The Great Walk that winds through the scenic Blackall Range. Montville will play host to all forms of music over the three weekends of the festival while Maleny will feature a lively buskers’ beat. A Festival of the Walks degustation dinner will be hosted at the award-winning Reserve Restaurant Maleny on August 30 and will feature local wines and food made with the freshest of local produce. The festival will close with a special dinner at On Mountain View near Maleny on September 13 with proceeds supporting Australia Zoo’s Wildlife Warriors. For a detailed program of festival activities and information about the walks visit www.festivalofthewalks.com.au. . For the perfect short break any time of the year visit www.caloundratourism.com.au or phone 1800 700 899 to speak to a local about activities and accommodation. Crikey! Bindi Irwin is turning 11 on 24 July, and Australia Zoo is going glamorous for the occasion, throwing a Masquerade party fit for a Wildlife Warrior princess. To help Bindi celebrate, all kids 14 years and under receive FREE entry to Australia Zoo on Bindi’s Birthday, with all of the glamour set to start at the extra early time of 8am! The glamour won’t get in the way of the fun though, with a massive ballroom and free dance lessons sure to get the kids into the swing of things. Even Australian Idol favourite, Jessica Mauboy, is coming to the party for a very special Bindi’s Birthday performance! That’s right – just before she joins Beyonce on her Australian tour, you can see Jessica Mauboy perform in the Crocoseum, and then meet her and get her autograph! The former Idol contestant is excited to be performing at Australia Zoo, and is looking forward to a FUN performance, which will include four of her hits, and her soon to be released single, Up Down, as part of the celebration. The pop star also expressed her appreciation for Bindi and Australia Zoo’s efforts towards wildlife conservation. “I know that Australia Zoo is very special in giving animals a living experience as close to their natural habitat as possible,” said Jessica. The birthday girl herself is very excited about celebrating her birthday in style with the pop star. “This is so exciting! To have Jessica Mauboy come to my birthday and sing in the Crocoseum is so beaut bonza!” said Bindi. Be sure to join in singing Bindi a happy birthday as she cuts her cake, and then get your very own piece! Plus check out FREE cupcake and cookie decorating workshops run by Green’s, and sign your birthday message on Bindi’s massive birthday canvas. There will be STACKS of free fun, including Flipside Circus, where you can learn to juggle or hula hoop, or just hang out on the ripper trapeze. Plus check out the face painting, colouring competition, SandWizard, the Bead Fairy and craft table, where you can make your own mask or crown. Don’t arrive fashionably late or you’ll miss out on your free muffin, and the first 1,000 people through the gates will also receive a FREE kids DVD thanks to Magna Pacific! You too could be celebrating your birthday at Australia Zoo simply by entering the Major Prize Draw, where you could even win a high definition LCD TV and iPod docking system thanks to WOW sight and sound and LG. Strewth! Get into the Masquerade spirit and enter the fashion parade for your chance to win some enchanting prizes. All of the Masquerade fun, PLUS all of the slithering, swooping, jaw-snapping action of the Australia Zoo Wildlife Warriors show, is sure to make you twirl, shimmy and shake! Check out Terri, Bindi and Robert as they celebrate Bindi’s 11th birthday, only at Australia Zoo, where Bindi Rules! How to SAVE with a Snow Holiday! It has been a remarkable season at Perisher, and it's still early days! The snow deliveryman made his first appearance for the season on Saturday 5 June and has been working considerable amounts of overtime ever since. To-date an accumulated 156cm of snow has settled across the resort, that's 71cm in June and 85cm since the beginning of July, allowing Perisher to offer excellent riding conditions across its four resort areas. At present the official snow reading, measured at Spencers Creek (1830m), is a respectable 112cm. The forecast for the remainder of the season is looking very promising. Pete 'The Frog' Taylor from Australia's number one weather forecast site snowatch.com.au is calling snowfalls around the 22 and 26 July, with a significant front expected on 3 August. We have already seen some amazing powder days with snow up to the knees, make the most of the awesome conditions a start planning your snow holiday today. This winter the boutique Perisher Valley Hotel is offering an Indulgence Package Special. Book 2 nights accommodation from $720pp or 5 nights accommodation from $1585pp and you'll also receive; full breakfasts, a la carte dinners, 2 or 5 day Mountain Passes, courtesy oversnow transport from Perisher Skitube Terminal to the Perisher Valley Hotel, plus FREE half-hour massage and welcome drinks on arrival. This package is valid from 4 September to the end of the season and is subject to availability. Call 02 6459 4455 for details. Purchase a Multi-Day Pass and SAVE! Ski or board Sunday afternoon for FREE when you purchase any 5, 6 or 7-day multi-pass starting on a Monday, mountain access is valid from 1pm on the preceding Sunday. Free 5th Lesson on Sunday afternoons when you purchase a 5 to 6-day First Timer Lesson and All Mountain Pass (Level 1 Lesson only). Free Night Skiing for children with a valid Mountain Pass. Free Mountain Pass and Skitube travel for children 5 years and under. Skitube Travel between Perisher Valley and Blue Cow is included with any valid Mountain Pass. September is a fantastic time to hit the slopes; the days are longer, the snow conditions excellent and there are always plenty of price specials available. This spring, purchase a 5-day consecutive pass for $427, which includes a 2.5-hour lesson daily, that's an amazing $85.40 per day including a lesson! This offer is valid from 7 September until the season closes, when pre-purchased before 31 August 2009. Log on to: www.perisher.com.au to view benefits. For a more convenient and stress-free trip to Perisher take the Skitube! If you're staying on-snow then park your car in the overnight security patrolled car park at the Bullocks Flat Skitube Terminal. Parking is FREE of charge and Skitube tickets include the NPWS entry fee too. Purchase a Family Open Return ticket for $168 (2 adults and 2 children) and save! Impress your friends, learn some new ski or snowboarding moves and blow them away with your expertise. Perisher's 2.5-hour group lessons for first timers through to the more advanced offer great value for money. Private Lessons are another great way to learn and save. Perisher offers a variety of personalised private coaching options to meet all budgets, personal needs and schedule. You can learn in a one-on-one environment, or bring your friends or family with you. Book a one-hour Early Riser lesson (8.30am) for 2-3 people for only $125! There's no need to lug all your gear to the snow, simply visit Perisher's Slopestyle Hire outlets in Perisher Valley, Blue Cow, Smiggins Holes, Guthega, Bullocks Flat or at The Station. They have all the latest equipment and clothing gear you will need to hit the slopes in style. If something is not quite right, they will simply exchange it at any one of our outlets. Plus, if you hire snow equipment from any Perisher Snowsports Hire after September 7, you will receive FREE locker hire for the duration of the hire period. Stow your gear close to the slopes and save time on getting back to your accommodation. You can Save 25% any time during the season by pre-booking your equipment hire through The Station at the time you make your accommodation booking. FREE Mountain Host Guided Tours! Learn to ride around Perisher's enormous terrain on blue runs and discover secret nocks and crannies and personal favourites with Mountain Host Guided Tours! This is a fantastic opportunity for guests to ski or board with a veteran of the Perisher slopes for FREE. The first tour of the season commenced on Monday 20 July and will be on every Monday, Thursday and Saturday from now on. The tour will convene at the Mid Perisher Centre at 10:00am. Guests can register with Guest Services the day prior to ensure a place or can simply 'turn up' at the meeting place on the day, but with no guarantee of snaring a coveted spot on the tour. Call Guest Services on 1300 655 822 for details. A snow holiday can be easy with a bit of planning, call Perisher Snow Holidays on 1300 655 811 or go to: www.perisher.com.au to find out how else you can cut the cost and save on your winter escape. Shed your winter woolies for a magical getaway in the hinterland of Port Macquarie, a warmer 4.5hours north of Sydney. It all begins 20 minutes from the coast, where country villages and 40,000 hectares of lush green valleys and forests, are one of the state’s best kept secrets. Stay in luxury accommodation, and save up to 50% off, unwind at winery events, indulge in cooking classes, or get outdoors on a horse-trail or micro-light flight. The hinterland’s four star Telegraph Retreat is offering a ‘Luxury Winter Getaway’ package until 30 September 2009. Second and additional nights are 50% off (AUD$150) when you spend $300 on your first night in a romantic self-contained Spa Cottage with a breakfast hamper for two people. Add on bonuses include a half hour massage for two people or a two-course fireside dinner with chocolates and a bottle of Bago Vineyard wine. Plus enjoy fresh flowers, fluffy robes & complimentary slippers, therapeutic wheat packs, scented bath salts and hand-made oil soaps. Set on eight rural acres, and with a heated swimming pool, this is tranquillity at its best. During the day, enjoy the crisp mountain air at Bellrowan Valley horse-riding, where you can join a two hour trail ride or overnight Pub Ride. The ‘Bellrowan experience’ offers magnificent vistas, through vast eucalypts, rainforest and fresh damper and tea at the Bush Inn on your return. For the more adventurous fly like a bird with Midcoast Micro-lights which offers scenic flights in an open two seater aircraft. The Hinterland’s Bago Vineyards is a must-do wine experience. The cellar door overlooks the Bago Hedge Maze, which when fully grown will be the largest hedge maze in NSW. Enjoy a wine tasting and sample regional produce including 16 local cheeses, Lorne Valley Macadamias, honey and olives. On the second Sunday of every month ‘Jazz in the Vineyards’ offers live music on the manicured lawns amongst the vines. Bago is a great venue for private events and functions. One of the hinterland’s best food experiences is at The Company Farm with its weekly program of four-hour cooking classes in the commercial kitchen. Local and guest chefs show you their skills with produce freshly picked from the farm, a sit-down lunch and stunning views through glass windows to the Hastings River. The program includes cheese-making, vegetarian, seasonal, international and cooking with allergies. At the heart of the hinterland is Wauchope, a thriving rural town with cafes, restaurants, accommodation and the Hastings Farmers Market on the fourth Saturday of every month. From here take a scenic drive to Comboyne via Byabarra, where the green patchwork hills could be Yorkshire, England. At the dairy-farming Comboyne, enjoy lunch at the Udder Cow Café and cheese-tastings at Comboyne Culture Cheese. Port Macquarie is a 4.5 hour drive north of Sydney and is serviced by regular QantasLink, Brindabella Airlines and Virgin Blue flights, just 40minutes from Sydney. For more information and to book any of these activities contact the Greater Port Macquarie Visitor Information Centre on 1300 303 155 or book on-line at www.portmacquarieinfo.com.au. Massive Greek Islands Cruise Sale - 2 For 1 Offer! Limited availability, 2 for 1 special on Variety Cruises for selected departures and cabin categories. Save up to $3491 per couple! For the first time ever Variety Cruises, the Greek island cruise company specialising in upmarket and casual cruising for no more than 40 passengers, is offering a massive 2 for 1 sale for selected cruise departures. The offers include the popular "Classical Greece" cruise aboard the brand-new, luxurious megayacht Harmony V. Her sister ship Harmony G operates the "Aegean Odyssey" cruise which includes the Turkish port of Kusadasi. For a little less luxury and a relaxed Greek experience, the "Jewels of the Cyclades" has October sailings on the 2 for 1 offer, operated by the motorsailer Galileo. Handpicked Holidays loves Variety Cruises! We are a genuine Greece specialist, having worked, lived and breathed Greece since 1981. Limited availability - don't delay! For reservations and information, contact Robyn at Handpicked Holidays. Two of Australia's natural icons - Uluru and the Great Barrier Reef - have been selected from the top 77 nominees to progress as two of the 28 Official Finalists in the global New7Wonders of Nature campaign, the New7Wonders Foundation announced today. The New7Wonders of Nature's Panel of Experts, headed by Prof. Federico Mayor, former director-general of UNESCO, made the announcement in Zurich, Switzerland, crowning a further seven finalists than originally planned due to record levels of participation. On behalf of the official supporting committee for Australia, Tourism Australia's Executive Chairman Rick Allert said all Australians should be proud that our iconic natural wonders have received such global recognition. "A place among the ultimate New7Wonders of Nature would be a stunning achievement for our nation's iconic natural wonders and we thank everyone who has played a part in ensuring Uluru and the Great Barrier Reef have made it through to this third and final stage, still in the running for the ultimate accolade," Mr Allert said. With the announcement of the final New7Wonders of Nature set for mid-2011, the real race for the title now begins. Uluru and the Great Barrier Reef will vie for a place in the final seven against 26 of the world's other most iconic natural sites including the Amazon; Angel Falls; Bay of Fundy; Black Forest; Bu Tinah Shoals; Cliffs of Moher; Dead Sea; El Yunque; Galapagos; Grand Canyon; Halong Bay; Iguazu Falls; Jeita Grotto; Jeju Island; Kilimanjaro; Komodo; Maldives; Masurian Lake District; Matterhorn/Cervino; Milford Sound; Mud Volcanoes; Puerto Princessa Underground River; Sundarbans; Table Mountain; Vesuvius and Yushan. Spokesperson for the New7Wonders Foundation, Tia Viering said that the New7Wonders Panel of Experts had a tough decision naming the 28 finalists. "Beginning with 441 nominations from 222 countries worldwide initially nominated in the campaign, we are now down to the final 28. It's been a stunning process to watch so many of the world's iconic natural wonders in the public spotlight and we are delighted to see both Uluru and the Great Barrier Reef are through to the third and final stage. They're up against the world's best – it's certainly going to be an exciting two years as we see which sites the public choose as the official New7Wonders of Nature," Ms Viering said. Voting will now recommence at www.australia.com for the third and final stage of the competition. To make sure Uluru and the Great Barrier Reef land a place in history, log on now and have your say. All votes are monitored by the New7Wonders Foundation and will alter the standing of each nominee in real time. Every vote will therefore count, and if you voted in the previous stages, you can vote again now as everyone is eligible to vote once in each of the three stages. Launched in 2007 by the New7Wonders Foundation, the New7Wonders of Nature campaign is a global search to recognise the seven most wondrous sites across the world through the eyes of the public. Nominations for the campaign were open to any clearly defined natural site, monument or landscape that was not created or significantly altered by humans for aesthetic reasons. More than one billion votes worldwide are forecast to determine the final New7Wonders of Nature across the campaign. For further information on Uluru or the Great Barrier Reef, or to cast your vote please visit www.australia.com. Cruiseco, a consortium of 160 of Australia’s leading cruise-specialist travel agencies, has designed a unique selection of 20-night luxury river-cruise-and-stay packages in Portugal and France between June and September next year in conjunction with AMA Waterways. They embrace the best waterways of both countries, include extended pre- and post-cruise sightseeing stays, and there are enticing Early Bird savings for those who book before September 30 this year. Each package begins with 3-nights in Lisbon and two days of escorted sight-seeing, followed by 7-nights aboard the luxury riverboat Amadouro on the Douro River from Porto to Vega de Terron and back to Porto with daily escorted sightseeing. There’s then a flight to Marseilles to join the equally luxurious Swiss Pearl in Arles for 7-nights cruising the Rhone River to Lyon, again with daily escorted sightseeing, and a transfer to Paris for 3-nights, including 2-days sightseeing and optional tours. Prices start from $9570pp* twin-share including First Class hotels in Lisbon and Paris, arrival and departure transfers in both cities and breakfasts daily, sightseeing as detailed in Cruiseco’s brochure, 7-nights cruising in both Portugal and France including onboard meals and onboard gratuities, wines with dinner and sightseeing as detailed. *Less $500pp if booked by September 30 2009. Switzerland has a reputation for superb albeit expensive skiing and snowboarding but, if you know where to look, it’s possible to find reasonably priced ski holiday packages in small and exquisite Swiss resorts. Popular with Europeans, these ski resorts warmly welcome Australians - firstly because they see very few of us and secondly because they’re amazed we’d fly 24 hours across the world to ski there. And the skiing is simply magical, with high altitudes, endless kilometres of runs, powder snow that stays crisp and dry, excellent lifting capacity and more than enough winter activities to keep every member of the family occupied for a week or two. Crans-Montana, Leukerbad and Bettmeralp are three such resort villages discovered by Melbourne skiers Mara Winthorst and Tim Jones, who have skied in Switzerland for ten years and run Swiss Trip ski holidays for four years. They chose these three because each is unique in some way, and all provide a first rate ski holiday at about half the cost of major ski resorts which attract high-spending international skiers. A very good range of accommodation is available, there are plenty of bars and restaurants, and menus often feature local specialties such as raclette and cheese fondue with produce from the surrounding valleys, as well as varied modern cuisine. A week’s skiing with Swiss Trip starts at $1,973 per person twin share for seven nights including Swiss Train tickets from airport to resort, meet and greet, hotel accommodation, breakfasts, ski passes and a day’s ski orientation with Mara and Tim. “Every skier knows that arriving in a new resort, finding your way around and sorting out ski lifts and runs can be quite confusing and time-consuming,” Mara said. On the ski orientation day, guests are familiarised with the mountain terrain and are taken to the areas best suited to their abilities. Twin villages located 1500m above the Rhone Valley, with views of the Swiss Alps from the Matterhorn to Mont Blanc. * 35 hotels, plus apartments. * 27 lifts, 140km of runs, highest ski altitude 3200m. * 5 minute walk from village to lifts. * Packages from $1973 per person twin share for seven nights. Located nearly 2000m above the Rhone Valley and bordering on the Aletsch Glacier, this car-free winter world is accessed only by mountain cable car. * 6 hotels plus apartments. * 36 lifts, 99km of runs, highest ski altitude 2647m. * Ski in – ski out from traditional wooden chalets. * Packages from $1992 per person twin share for seven nights. Switzerland’s largest thermal spa resort, with 65 thermal springs and numerous baths for après ski relaxation, surrounded by 4000m high mountains. * 28 hotels, plus apartments. * 11 lifts, 52km of runs, highest ski altitude 2610m. * Packages from $2060 per person twin share for seven nights. Winter Warmers with Vacations & Travel! WHALE WATCHING SEASON HAS HIT WARRNAMBOOL!